BEFORE SELECTING THE BEST SIGNALLING TYPE FOR THE REQUIRED HEADWAY, A COMPARATIVE STUDY OF THE DIFFERENT TYPES AND THEIR LIMITATIONS MAY BE IN ORDER. TO PERFORM HEADWAY CALCULATIONS, WE CONSIDER TWO TRAINS FOLLOWING EACH OTHER AT FULL SERVICE SPEED AS SHOWN ABOVE. FIRST, LET US TAKE THE CASE OF TRAIN 1 BEING IN OVERLAP AFTER PASSING SIGNAL D, WITH SIGNALS C & D AT RED AND SIGNAL B SHOWING YELLOW. ‘READING POINT’ i.e. SIGNAL B WHERE HE SHALL START BRAKING. SUPPOSE JUST THEN, TRAIN 1 CLEARS THE OVERLAP AT SIGNAL D WHICH TURNS SIGNAL C TO YELLOW AND SIGNAL B TO GREEN. NOW, TRAIN 2 CAN CONTINUE TO RUN AT FULL SPEED WITHOUT BRAKING. AT THIS MOMENT, THE DISTANCE BETWEEN THE TWO TRAINS IS: THE CLOSEST DISTANCE BETWEEN TWO SUCCESSIVE TRAINS AT FULL SPEED, CALLED THE HEADWAY DISTANCE. DGR = (HD – R – O – L) = (HT x V) – R – O – L.
(IT SHOWS THE DGR DEPENDS ON THE HEADWAY REQUIRED BY THE CUSTOMER). WE CAN NOW CALCULATE HOW CLOSE THE GREEN ASPECT MUST BE TO THE FIRST RED ASPECT BEYOND (MINIMUM REQUIRED ‘DGR’ FOR BETTER TRAFFIC FREQUENCY). IF THIS FIGURE FOR DGR IS TAKEN AS MAXIMUM AVAILABLE, THE GREEN SIGNAL CAN BE DRAWN CLOSER TO THE RED SIGNAL AND THE CUSTOMER MAY OPERATE A MORE FREQUENT SERVICE AT SOME EXTRA COST. HEADWAY CALCULATION BALANCES THE SAFETY AND SERVICE REQUIREMENTS FOR KEEPING THE SIGNALLING ARRANGEMENT MOST ECONOMICAL. ‘WORST CASE FOLLOWING TRAIN’ IS THE ONE AT THE (FIRST) CAUTION ASPECT SIGNAL AND THIS CAN NOT RUN AHEAD OF THE SIGNAL AT FULL SPEED. IT IS HOWEVER AT THE SERVICE BREAKING DISTANCE FROM THE NEXT RED SIGNAL. FOR THE AIMED QUALITY AND QUANTUM OF SERVICE, THIS CONDITION IS GENERALLY AVOIDABLE. THE ‘FOLLOWING SERVICE TRAIN’ SHOWN BEHIND GIVES A BETTER OVERALL HEADWAY OF LINE DUE TO THE MAINTAINED FULL SPEED. * 2 ASPECT SIGNALLING IS BEST SUITED WHERE THERE IS AN INFREQUENT TRAIN SERVIE LIKE FREIGHT TRAIN SERVICE. * IN 2 ASP. SIGNALLING, A ‘RED & GREEN’ STOP SIGNAL CONTROLS ENTRY IN TO A RELATIVELY LONG BLOCK SECTION. ALSO A ‘YELLOW & GREEN’ DISTANT SIGNAL IS PLACED BEHIND AS ITS REPEATER TO WARN THE DRIVER OF THE STOP SIGNAL AT A ‘SIGNAL BRAKING DISTANCE’ IN ADVANCE. * DGR IS CALCULATED BASED ON THE CUSTOMER INPUT DATA. 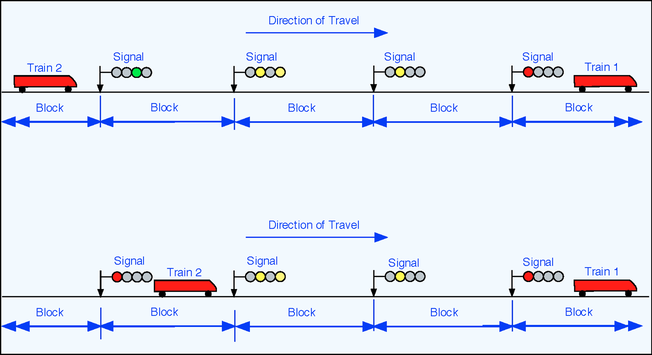 * IT IS EVIDENT FROM THE DIAGRAM THAT STOP SIGNAL SPACING, D2 = MAX.DGR – 1.5 S.
* IF THE DISTANT SIGNAL IS AT MINIMUM ‘S’ BEHIND ITS STOP SIGNAL,THE STOP SIGNAL CAN BE PLACED FURTHER BEHIND THE STOP SIGNAL IN ADVANCE, SO THAT THERE WILL BE LESS NUMBER OF SIGNALS ON THE LINE RESULTING IN OVERALL ECONOMY. * 3 ASPECT SIGNALLING IS SUITABLE FOR MODERATELY FREQUENT TRAIN SERVICE LIKE MAIN LINE EXPRESS TRAFFIC. * IN THIS, EACH IS A STOP SIGNAL WHOSE ASPECT IS REPEATED BY ITS SIGNAL IN APPROACH. * IT CAN BE SEEN BELOW THAT DISTANCE BETWEEN SUCCESSIVE SIGNALS ‘D3’ HERE IS DIRECTLY RELATED TO BOTH ‘SAFETY’ AND ‘SERVICE REQUIREMENTS’. * THE SAFETY & SERVICE REQUIREMENTS ARE INDEPENDENT OF EACH OTHER. * THEY MAY OR MAY NOT BE COMPATIBLE. * THEIR COMPATIBILITY CAN BE ASSESSED IN THE FOLLOWING PROCEDURE. * THE USABLE RANGE OF VALUES OF ‘D3’ IS FOUND WHERE THE SAFETY AND SERVICE BANDS OVERLAP. * THIS GIVES A USEFUL MARGIN FOR THE POSITIONING OF SIGNALS TO COPE WITH SITE CONSTRAINTS. * IT IS PREFERABLE TO KEEP ‘D3’ AS LARGE AS POSSIBLE WITHIN THIS RANGE TO KEEP THE COSTS LOW. * IF DGR/2 IS >1.5S ( OR DGR > 3S): THE USABLE RANGE COINCIDES ENTIRELY WITH THE SAFETY RANGE. DUE TO THE SAFETY CONSTRAINTS, 3 ASP. SIGNALLING IS ENABLING A MORE FREQUENT SERVICE THAN REQUIRED BY THE CUSTOMER, BUT AT A SLIGHTLY INCREASED COST. * 3 ASP. SIGNALLING IS PROBABLY STILL CHEAPER THAN 2 ASP. SIGNALLING AT THIS STAGE WITHIN THE RANGE(WHERE ‘DGR’ IS JUST ABOUT >3S). 3 ASP. SIGNALLING REQUIRES MANY MORE SIGNALS THAN NEEDED TO RUN THE SERVICE. * AT THIS STAGE, IT MAY BE CHEAPER TO PROVIDE 2 ASP. SIGNALLING AS CAN BE SEEN BELOW.